The israel hour spends 60 minutes each week playing nothing but your favorite Israeli tunes! Each week, thousands of listeners from around the world tune in to listen to their favorite Israeli artists - accompanied by enthusiastic discussion and commentary in English. HOW TO LISTEN Just click on the dates below. Or you can listen online or on your phone at this link or on iTunes. 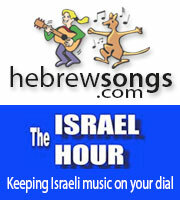 Listen now to The Israel Hour Radio Archives with playlists and links to song words. Click on any date below to hear each program. You can keep browsing other windows while listening, and pause at any time. Where can you find all of Israel's biggest musical celebrities in one place? You've found it. The soundtrack to your week includes music by Shlomi Shabbat, Moshe Peretz, Kaveret, Rita, Ivri Lider and a special medley of songs from "Les Miserables" in Hebrew. Plus - we think we've found the next big Israeli hit song. Are we right? Another week, another awesome music mix. This time, we'll hear brand new music by Cafe Shachor Chazak, Hatikva 6, and Natan Goshen mong others, take a look at the number one song of two years ago this week, meet Israel's representative to the 2017 Eurovision Song Contest...and have a lot of fun doing it all. We hope you'll join us! Mairov Dubrovsky joins us this week with some of the strangest Israeli stories of 2016, as well as some of the hottest Israeli tunes of 2017! Hear the top three songs of the week, info on our upcoming appearance in Bethesda, MD, some great requests and more! Our first show of 2017 features a look back at Israeli music in 2016. What are Josh's picks for the best songs of the year? Find out in this great hour of Israeli music! It's Chanukah 5777! The Israel Hour is here to offer the soundtrack to your sufganiyot. Enjoy an hour of great Chanukah music, from traditional Israeli classics to modern favorites, with a few surprises thrown in for good measure. Our special guest this week: the amazing DAVID BROZA! David speaks with us about his career, his recent documentary on Netflix, his "old" new song, his upcoming show in New York City...and more! Plus, a tribute to the late Ahuva Ozeri, and a ton of hot brand new Israeli music! TODAH! On this Thansgiving weekend in the USA, we're playing songs of thanks...in addition to some of Israel's hottest new music! You'll hear amazing collaborations between Eliad and Shimon Buskila, Ehud Banai and Barry Sacharoff, Avraham Tal and Infected Mushroom and many more! 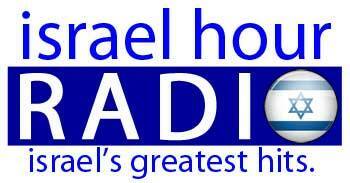 THANK YOU for listening to Israel Hour Radio! We try NEVER to get political on your favorite Israeli music show, but we feel obligated to pay homage to the new POTUS with the only appropriate song we could find. Plus - more on the great Israeli concerts touring the USA, incredible new Israeli music, a Hebrew tribute to the late Leonard Cohen...and more! We continue our wrap up of 5776 in review, with more of the year's best music...PLUS the top three songs of the new year (so far)! Shana Tovah! Our first show of the year is our favorite show of the year...counting down the top songs of 5776! What were the hottest Israeli songs of the past year? Did your favorite songs make the list? Tune in and find out! The Rosh Hashanah show. Songs of Jewish New Year, old and new. Tributes to the late Shimon Peres. Looking for Israel's hottest songs? You've come to the right place! You'll hear the top four songs on Reshet Gimmel's weekly countdown..... plus a look into Idan Raichel's upcoming solo appearances in the US! All that and much more, this week on Israel Hour Radio! Our annual Yom Ha'atzmaut spectacular. Celebrate Israel's 68th birthday with your favourite Shirei Eretz Israel......songs celebrating the land of Israel. An abbreviated show this week, jam-packed with great music! We look at new albums from Shlomo Artzi, Eyal Golan and The Revivo Project...hear from Subliminal on why Israeli rap needs to be political...play some great songs you probably haven't heard in a while...and more! The Israel Hour brings "the stars of Israel to the skies of the world," with the very best in Israeli music. The Israel Hour often produces special programming devoted to Israeli religious/cultural holidays (Israeli Independence Day, Jerusalem Day, Chanukah, etc. ), as well as special shows dealing with unique themes in Israeli music (past examples include shows devoted to children's music, Mizrachi (Mediterranean) music, music of the Eurovision and Pre-Eurovision Song Contests, countdown shows, etc.). The Israel Hour offers the very best in Israeli music - from classic favorites to contemporary hits. You won't find a better variety of great Israeli music - along with discussion and commentary in English - anywhere else! Where it began and why listen? "Israeli Music: Are You Listening?" Josh Shron's Yom Ha'atzMaut blog 2016: "Sounds of Pain, Sounds of Pride"
© Copyright 2016 Jewish World Life Online Network .- all rights reserved.